Photo right: The Rev. 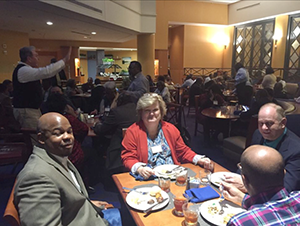 Sarah Windham (centered) during a dinner with fellow clergy of the Mississippi Conference at the Convocation for Pastors of Black Churches. Photo below right: Mississippi Conference District Superintendents joined their pastors at for the convocation. Sitting left to right: Rev. Rusty Keen (Meridian), Rev. Mattie Gipson (Greenwood), and Rev. Stephen Cook (West Jackson). Standing left to right: Rev. Tim Thompson (Dir. Faith Community Formation), Rev. Cynthia Cross (Hattiesburg). Anticipating her experience would be a positive one, the Rev. Sarah Windham of the Mississippi Conference United Methodist Church, attended the Convocation for Pastors of Black Churches in Atlanta, Jan. 10-12. She also expected to be one of a few Caucasians at the event planned by United Methodists -- open to all races and denominations. "We have to forget about color and just worship. I was very much at home, and I feel grateful for the experience. I thought, God I know you have something for me. Don't let me miss it." According to Windham, God granted her wish. The convocation's theme, "Called to Fresh Vision," resonated with her. Throughout the conference, she witnessed what she describes as worship without preservation. "People were not looking around to check out everybody else. They were just praising the Lord, raising those Holy hands. It was encouraging to the way I respond and live in my call. It was a fresh vision. Now, all I have to do is figure out a way to put it to work," said Windham who pastors two predominately white congregations. The other Caucasian clergyperson from Mississippi present was Meridian District Superintendent Rusty Keen. He stated that powerful worship, preaching, and teaching immensely blessed him. "It was a mountain top experience. It was more than what I expected. It was probably one of the greatest spiritual experiences of my ministry. The Holy Spirit was alive and on fire," Keen expressed. His district has the most African-American churches in the Mississippi Conference with 47. For this reason, Keen made the trip to support the 11 preachers from his area that went to the convocation. "I learned there is a need for our African-American churches to have that boldness and desire to go beyond anything God has ever called them to be in the past. What I left with was a greater awareness of the power of worship in predominately African-American congregations. I left with a new vision and new spirit for how I lead as their chief missional strategist," said Keen. At age 70, Rev. Rachael Pitts, an African-American attendee serving in the Mississippi Conference said she was very proud of the conference presence at the convocation with 45 pastors. They were among the largest groups. Like her colleagues, she impressed with the leadership of the convocation. "Many of them were young (ages) 20 to 30 and so committed to God's work and so open to God's work. There was a lot of encouragement and support for us (pastors) and what we are doing. It is so refreshing and reviving that all of the work of organizers has produced some fruit," said Pitts. 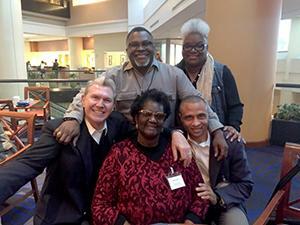 Plans are underway for the Mississippi Conference Convocation on the Black Church in October. Pitts added she is confident that Mississippi's leadership will plan an exciting gathering. She, Windham, and Keen will attend and urge others to join them.